They are rapidly becoming the most vilified group in British society. Lampooned by comedians, attacked by social commentators, portrayed by the media as loud, vulgar and abusive, and increasingly seen as a drain on the public finances. But at least MPs are able to speak up for themselves. Is there anyone out there who will take up the cudgels on behalf of that other much maligned social subset - the chav? Since the word crossed over into the mainstream last year, after first appearing on satirical websites, chav has become a catch-all term for a flash or showy working class person. Everyone from millionaire footballer Wayne Rooney and his girlfriend Colleen to the shoplifting single mother character Vicky Pollard, from BBC One's Little Britain, has been labelled a chav. The Sun newspaper ran a "proud to be chav" campaign. The word has even entered the dictionary, defined as "a young working class person who dresses in casual sports clothing". But one chav-baiting website sums it up more succinctly as Britain's "new peasant underclass". Michael Collins, author of The Likes of Us, a biography of the white working classes, says there is nothing new about the middle classes sneering at working class people who are a "bit affluent" or showy. But the difference with the chav phenomenon, he adds, is that much of the vitriol has come from people "who consider themselves progressive". "It has become quite a jokey thing. But the white working class are the last acceptable group to demonise," he says. Liverpool MP Louise Ellman sees parallels with the way Liverpudlian youths were labelled "scallies" in the 1980s. "I think it is all too easy to label other groups with ugly-sounding words. I think it is negative and not very helpful," she says. 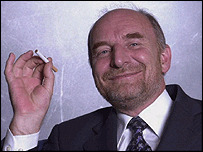 Ealing MP Stephen Pound says he is happy to be the Parliamentary spokesman for the chav nation. "I am an aspirant chav. My off-duty wear is a Fulham shirt with 'these colours don't run' on it. I don't have a lot of gold rings, but I am saving up for them. My daughter had her ears pierced at a fairly young age," the Labour MP says. He sees the chav phenomenon as an insidious form of social snobbery. "People who use the word don't understand the joy and confidence in display. They are just jealous that they can't play football as well as Wayne Rooney. "It is yet another example of class snobbery. What on earth is wrong with a bit of flash, a bit of bling bling. It keeps a lot of jewellers in business." Liberal Democrat MP Lembit Opik says he is angry about the way the word is used to attack young working class people, particularly when it is used in conjunction with other terms, such as "council house scum". "The same people who talk about chavs probably used to talk about the lower classes as regrettable and nasty. It is like the last days of the Raj. "I do feel strongly that people who think this is a genuine label are really only labelling themselves as snobs." The only way to combat the word, Mr Opik argues, is to invent labels for people who use it. "I would describe myself as a TAFF - a tolerant and friendly fellow, and I would describe who people who use the word chav as BAPS - boring and pompous snobs." It may be snobbery, but it's great fun. I mean these people are asking for it behaving the way they do. Chavs have votes and can buy newspapers. That's the only reason MPs and journalists have taken to them. Of course it is classism. How long did that take everyone to realise. The growing underclass, which is the result of the widening inequalities (an inevitable by-product of free-market capitalism) makes the lives of middle class people (ironically those who generally perpetuate the problems with their unchecked consumerism) hell. The only solace we have lies in "holiday showdown" and "wife swap" where we can escape the realities of a crumbling society and feel superior. Laughing is fine but every Conservative vote and every pence moved away from education will ensure the proliferation of "les miserables". Chav is a middle class word created to keep working class people down, I bet if you went to a council estate and asked do you think you are a chav? Most would answer what is one? Society inevitably labels groups of people for convenience, some MPs need to get a grip and stop being so PC. Lembit Opik's constant PC obsession risks my support of the Lib Dems. He's plainly wrong. Just as it's perfectly fine to call me a Paddy as I'm Irish, it's perfectly fine to label the Vicky Pollards of this world as Chavs. I also feel that most Chavs are perfectly capable of defending themselves usually in the form of anti-social behaviour. It's reality, not snobbery, and these MPs do not obviously have to mix with the rest of us who suffer them on a daily basis in many neighbourhoods. Being a working class man, I find it extremely offensive that the term working class is applied to these creatures, as clearly non of them work. I think to use such a term is to degrade the contribution the true working classes have made to this country. I know I'm going to be called a wishy-washy liberal for saying this, but say it I shall. Why isn't anyone questioning the reason for the existence of chavs in the UK? It is hard to deny that this is a nasty and derogatory term for anyone to be labelled with. But with the UK appearing more and more socially divided at a time when it has never been a richer nation, the question to be asking is whether or not the very existence of chavs is due to the sneering and uncompassionate attitude, typified by the comments made here. Treat people like animals and they behave like animals. Treat people with respect and provide equal educational and social resources and we might find that 'chavs' are made of better things. "Flash or showy working class person"? No, no no. Chavs (or scallies, as they're known where I live) are the dole-dossing, abusive, foul-mouthed, scum types. Townies are their 'gentler' cousins who, although wearing the same clothes, actually get jobs and try to avoid a criminal record, pregnancy, or both, before having left school. Yeah but no but yeah but no but yeah but no! If MP's want to know why Chavs have such a reputation then I suggest that they leave their luxury homes in the country and their apartments in London and take up a 3 month residency in pretty much any inner city area. I am sure that when their property is then vandalised or they are harassed for no reason, they will see first hand what all the fuss is about. It is time that MP's actually took their head out of the sand init! I think many people's problem with chavs is that so many of these "working class" people don't work. The resentment the middle classes feel towards them comes from the fact that we pay more and more of our income in tax to keep chavs / neds / scallies in Adidas tracksuits, jewellery and trainers which cost more than we can afford after our pay check is cut in half by tax. What this article does show is that the Labour and Lib Dem parties are happy for this phenomenon to continue. We need a strong centre right government that will reform the benefits system and force people to work. I earn a lot less than the "average" wage for people in the UK. Last year less than £7k pa. If I am not "working class" myself I would like to know what is. I will make fun of chavs if and when I want to. If I feel that these people look and sound ridiculous I have the freedom of speech (don't I?) to laugh. If I think a "chav'd" out Corsa car is stupid, that is my right as a tax payer in this country. Jealous, no I am not I am fairly happy with the life I have. Stop being a sheep Mr Pound, get off the bandwagon. Go hang around with these chavs for a few weeks, drinking cheap drinks and causing a nuisance. Then see how you feel about the sheep you aspire to be. I don't have a problem with anyone based on what they wear, that really is snobbery. On the other hand I do have a problem with the "chavs" that are openly abusive and threatening, the ones that sit drinking alcohol of any description ('cos it makes 'em look hard, innit) while shouting abuse at passers-by (wot yer lookin' at? ), and the ones that drive their pride and joy (usually a badly modified and hideous old Peugeot 106 with a mismatched spoiler and half-painted skirts) around car parks screeching tyres and pumping out music at 2 o'clock in the morning. I don't judge people on style or class or income. What I have a problem with is wanton idiocy. I think the MPs have got this slightly wrong, what chavs wear helps you to identify them, but isn't in itself the reason for singling chavs out; what people dislike about chavs is their behaviour, which varies but can include such pleasant things as - spitting in the street, shouting at people, throwing kebab wrappers all over the street, throwing up in the street on a night out etc etc. Not all young working class people are chavs, and I would say that people from all classes can be chavs. The key is bad public behaviour and manners, and no class has the monopoly on that. We are used to hearing some absolute drivel from Lembit Opik but this takes the biscuit! Chavs they are and Chavs they will always be. Uncouth, unattractive and uneducated riff-raff. If by stating this I am a 'snob' then I wear this as a badge of honour! As a 19 year old, I think some people are a little confused as to what constitutes chavvery. Though I wouldn't wear such things myself, I have some 'trev' friends who wear Adidas etc, but that doesn't make them chavs - in the same way that owning fewer than 10 tracksuits doesn't make you exempt. What makes you a chav is the way you act - generally chavs exclusively hang out with chavs (how's that for classism?! ), and are rude and threatening etc to all others that don't fit into their cliché. So if Stephen Pound really wants to be a chav, he'd better get ready for a change of company! The term chav may have entered the mainstream, but unfortunately the media and politicians alike have completely misunderstood what it refers to. Chavs (or Neds as they're known in Scotland) are not characterised by what they wear. Hint: in the acronym Ned, the D stands for delinquent. Proud to be a Chav? In this politically correct day and age, no wonder these people are being elevated to the status of decent, while in real life they are little more than arrogant fascist criminals, from my experience. I wouldn't be surprised if a new party is formed against chavs. Anyone want to help me to set up the Safe Thinking Unifiying People In Desire to get rid of Chavs. The short version? STUPID Chavs! Are the government about to introduce a "Chav Hatred" law? It's got nothing to do with class. It's got everything to do with morons who are proud of their ignorance. Or is it wrong to think that is a bad thing these days? For the final time being a Chav is about attittude not about class! Working class does not equal chav. A person swearing every other word, having no respect for people and property, and being violent and intimidating - Now that's a chav! When the Prime Minister talks about a "lack of respect" in the country we all know what sector of the population he was referring too, even if he didn't realize it himself. The word "chav" was funny when it was only applied to the people who deserved it - the antisocial, foul mouthed lot who live off the dole and/or child benefits. Unfortunately, it has been hijacked by middle class snobs as a way for them to put the working classes down without looking like snobs (in their own eyes), because calling people chavs is "just a bit of fun".